Earlier this month, Chinese model Liu Wen hinted that she might be involved in a fashion-oriented advertising campaign for the Apple Watch. 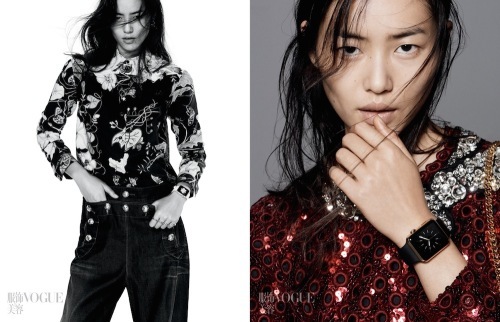 As it turns out, Liu Wen will be featured in Vogue China's November issue, wearing the Apple Watch on the cover of the magazine. Wen appears to be wearing the 18-karat yellow gold Edition Apple Watch, which features a red Modern Buckle Band. She's also featured wearing other Apple Watch models on a spread inside the magazine. In an interview with The Business of Fashion, Vogue China editor-in-chief Angelica Cheung has revealed the details behind the partnership between Vogue and Apple that led to the device being featured on the popular magazine's cover. According to Cheung, she met with Apple CEO Tim Cook and design head Jony Ive ahead of the device's September 9 unveiling. Cheung says that the duo walked her through the development of the Apple Watch, which left her "impressed by their thoughts and passion for the project." Cheung said that she thought the watches "combined technology, style, and functionality and were very modern," making them a good fit for Vogue China. Cheung believes that Cook and Ive opted to give the Apple Watch its editiorial debut in Vogue China due to China's willingness to embrace new technology. "Chinese people are actually very digitally minded and we embrace new technology and digital products more easily than perhaps people elsewhere," said Ms Cheung. "We are an ancient country but at the same time a very young country when it comes to fashion and new products. We love to embrace everything that is new, modern and positive," she added. "All these convince us that the intersection of fashion and technology is a natural progression, not something alien." Apple's choice to show off the Apple Watch in Vogue China speaks to how important the country has become to the company. China marks an opportunity for significant growth for Apple and earlier this year, China's largest cell phone carrier, China Mobile, began offering the iPhone in what Tim Cook called a watershed moment. Cook visited China several times in 2013, and Apple has opened several new retail stores in the country in 2014, including locations in Wuxi, Chongqing, and Beijing. The Apple Watch marks Apple's first foray into the fashion world, and the company has been working to position it as a high-fashion accessory. In addition to getting its editorial debut in Vogue China, the Apple Watch saw its retail debut at French luxury boutique Colette in late September. Apple is likely to hold additional fashion-oriented events as the Apple Watch's early 2015 debut date approaches, aiming to promote the device as much as possible. Apple may also take a variety of approaches in its Apple Watch advertising, to reach a wide range of potential customers. June rumors suggested the Apple Watch was also being tested with multiple professional athletes that could also take part in future advertisements. The Apple Watch is expected to launch in early 2015 and the device will be available in a wide range of materials and at several different price points. On the lower end, the Sport version of the device will retail for $349, and rumors have suggested the higher-end solid gold Edition models could sell for thousands of dollars. I love fashion, but this product fails, as do the people that wear it. Who really fails? The model in the photo who is among the top 5 paid in the world, or the guy who spends time caring about what other people choose to wear and uses that to form an opinion about them as people? It looks great on the model. I can't imagine how huge and ridiculous the Moto 360 would look on her. First foray into fashion? No one remembers iPod socks? I'm actually starting to see the fashionable side to the Watch the more I see things like this. It's far more fashionable than any other watch within that realm of function that we'll see for a long time. Great shot on the cover. Really well done highlighting the watch with other fashion. Love the composition of the photo. This Apple commissioned shot was done by fashion stylist Karl Templar. I'm not surprised Apple is going down this route. I suspect we'll see a fair amount of advertising in magazines like Vogue, GQ, etc.